Is TaskRabbit Your Lemonade Stand on steroids? Previously unemployed or underemployed people are making big bucks each month on sharing economy sites. NEW YORK (TheStreet) — It may be time to quit your day job. Two and a half years ago the Las Vegas resident was making about $52,000 a year as a stage manager for an event production company and was in search of a second job to help pay off debt. Before long she came across Fiverr, an online marketplace for individuals selling creative and professional services, everything from graphic design, to writing, translation, illustration and marketing. Horrocks, who has a degree in communications and worked in theater for years after college, offered voiceover services on the site. Business was slow initially; she received just a few orders here and there. But before long orders increased exponentially and after one year, Horrocks had more work than she could handle. "Two and a half years later, it's my full-time job," says Horrocks. "I work between 30 and 40 hours a week, but I never work more than five hours a day. And I'm making twice as much as I was making before at a regular day job. I'm working 30 hours a week and making six figures." It may sound too good to be true, but it's not. Horrocks is just one example of individuals who are earning decent money from booming sharing economy websites such as Fiverr and TaskRabbit. 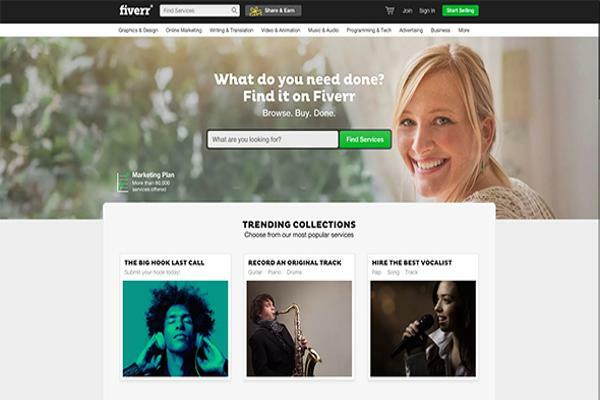 Fiverr officials say the site has tens of thousands of users who generate a steady secondary income stream through its gigs, money used to pay for various life expenses - everything from down payments on a home, to buying new cars and paying child adoption fees. Millennials in particular are attracted to the income and freedom of working as micro entrepreneurs for a site like Fiverr, which says 76% of its sellers come from that generation. Launched in 2010, Fiverr is now doing business in 190 countries and offers 4 million services for hire. Used primarily by freelancers, the site provides such sellers with a global marketplace. While many people get caught up on the fact that sellers must initially offer services for a mere $5, that's just a starting point explains Fiverr's Chief Revenue Officer David Manela. "By starting at $5, it creates a no brainer purchase - it's an easy purchase," says Manela. "For buyers to try something at that price is very reasonable. It's a very easy purchase. And often, getting that first customer is the most difficult. Once you get a customer and do a good job, it turns into more and more revenue." Offering that initial service at $5 also removes the strain of haggling over costs or pay rate, simplifying things. The real money however, appears to be in the premium gigs through which advanced sellers can augment their services, charging a higher price for additional services. For example, if you're a copyeditor, perhaps you charge $5 for editing, but additional fees for formatting, layout or a rush turnaround. That's when the income starts to add up. The site also allows for what it calls "custom offers," a mechanism through which a seller can put any price on a service - as much as $7,000 to $10,000. "My rates start at 125 words for $5," says Horrocks of her voiceover services. "But I have tons of clients who need 2,000 words or 4,000 words, so that can add up. About 75% of my projects are bigger then 125 words." "You still get the $5 jobs," she adds. "I do people's voicemail greetings for $5. But I can do them so quickly; it's very little time investment. And I can do about 30 to 35 of those types of orders a day." Not to be overlooked, for those considering offering their services on the site, is the fact that Fiverr takes 20% of all transactions. TaskRabbit, meanwhile, provides another eye opening example of how much money is being made via sharing economy sites. The site currently has about 30,000 taskers spread throughout the United States and London. Between 10% to 15% of those taskers make a full-time income performing odd jobs through the site, says spokeswoman Jamie Viggiano. And when she says full-time income, Viggiano is talking about people who are grossing $6,000 to $7,000 per month. "One guy even netted $12,000 in a month," Viggiano adds. "But those are active taskers. For the 85% of taskers who aren't that active, or who have a full-time job and are just looking for extra income, what they're doing is managing to pay two or three bills a month from the income they bring in working nights and weekends as taskers." Not a bad deal no matter how you look at it. Run a few errands, perform a few odd jobs and earn the money to pay a handful of bills. One of the major differences between Fiverr and TaskRabbit is that in order to be a tasker, the site must approve your application. There is a formal vetting process. Anyone can offer his services on Fiverr. About 4,000 people per month apply to be a tasker, says Viggiano. And it's a well-educated crowd. More than 80% of applicants have a bachelor's degree or higher. There are doctors, lawyers and a variety of other working professionals using the site to make extra income. "We have people who are musicians and are between gigs and just need some income," Viggiano continues. "Or actors and actresses who are in between jobs, using this make some income." The gender breakdown of taskers meanwhile is split evenly between men and women. The 10% to 15% who earn a full-time income, however, are mostly male and are typically those doing construction or handyman tasks, says Viggiano. Those working through TaskRabbit are allowed to set their own pay rates, which can be adjusted at any time. "We don't predetermine anything," Viggiano says. "As a result we see some of the highest hourly rates in the sharing economy. Taskers make an average of $30 per hour." Handymen tend to make around $50 an hour, but depending on the zip code, they sometimes charge up to $100 an hour. The variety of services offered through the site runs the gamut from packing, to party planning, to grocery shopping, and even includes such things as writing and editing. When it comes to maximizing your earnings on the site, Viggiano has a few key tips and words of advice. First, she says, continually adjust your hourly rate. Figure out what the market will bear. As you obtain more experience in your chosen service category, increase your rate. If you start offering services in a category that is new for you, bring your rate down and then increase it as you move forward. Viggiano's second bit of advice is basic, sound business practice - deliver great service to clients. TaskRabbit service providers are ranked based on client reviews, ratings and recommendations. "People get paid the rate they want based on how they're performing," Viggiano explains. "Reviews are key to the site." Emily Cherin, a 49-year-old Jersey City tasker, offers her services in a variety of categories on the site including writing, editing, personal assistance, shopping, organization, packing and moving, elder care, pet sitting, cooking and baking. She turned to TaskRabbit when a traditional job search proved fruitless. "I was sitting in my apartment job hunting like a crazy woman," says, Cherin, who has a graduate degree in broadcast journalism. "Literally I put in more than 100 applications and was getting no response. I had no idea the job market would be so challenging. 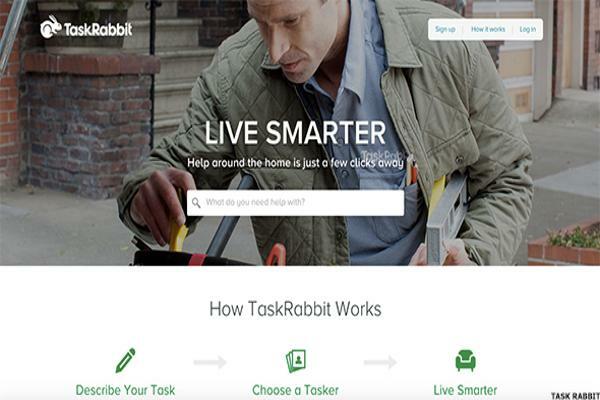 My 82-year-old aunt had heard about TaskRabbit and suggested I look into it." Those desperate days of job hunting are now long gone. Since signing on with the TaskRabbit in November, Cherin has completed so many tasks and earned such rave reviews from clients that she's been named one of the site's 'elite' taskers. Cherin has three steady clients and picks up numerous other tasks each day and week. For one of her clients, Cherin manages all bills and receipts. "I put them all into a spreadsheet for her every month, that she has to turn into her employer," Cherin explains. For another client, a Maryland-based grant writer, Cherin manages correspondence regarding grants. She also visits an elderly Greenwich Village resident every week, where she opens and organizes bills. "It takes me about an hour, and she pays me for four hours," Cherin says. Other jobs she has performed include editing film scripts, writing bios, organizing closets, helping people to unpack and event staffing. TaskRabbit is Cherin's full-time job. She earns about $4,000 a month. As an elite tasker she typically charges about $65 per hour. From that, TaskRabbit takes 30% for the first task performed for a client and 15% from subsequent tasks with the same client, she says. Cherin couldn't be happier with life these days as a result of her flexible and lucrative gig. "This has totally changed my life," she says. "It totally saved me. All of sudden I was out and about, all over the city, meeting super interesting people. It was amazing. I could not have created a company that was more suited to me personally because I don't like to sit still. I have such a diverse skill set and this is really fun. It allows me to do so many things and learn and grow."